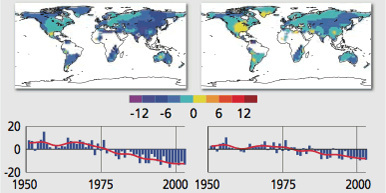 Observed trends (in days per decade) in the frequency of extreme temperatures compared to the 1961-1990 averages. 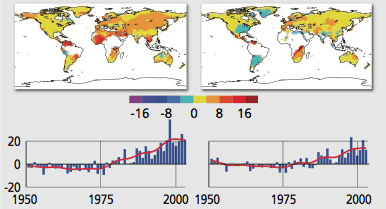 Global warming is increasing the frequency and intensity of some types of extreme weather. For example, warming is causing more rain to fall in heavy downpours. There are also longer dry periods between rainfalls. This, coupled with more evaporation due to higher temperatures, intensifies drought. 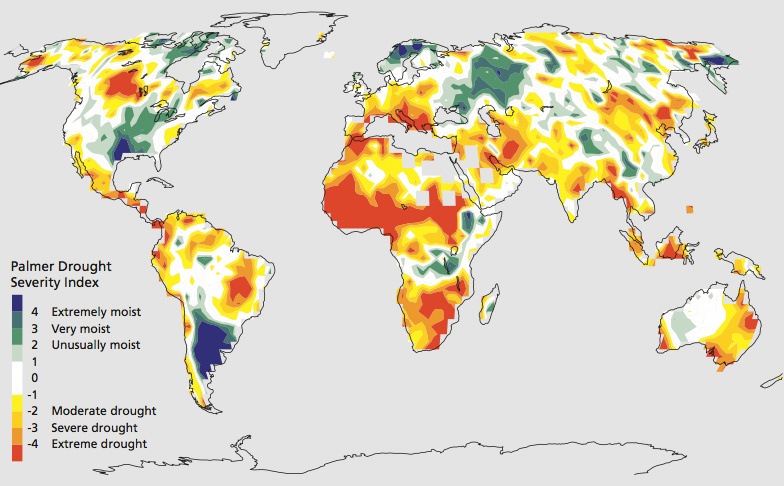 Wet places have generally become wetter, while dry places have become drier. Heat waves have become more frequent and intense, while very cold days have decreased. 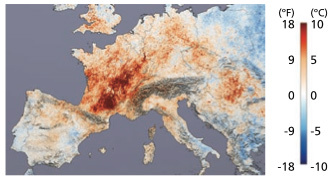 Unprecedented heat in the summer of 2003 caused an estimated 70,000 premature deaths in Europe. As shown on the map, temperatures that summer in parts of Europe were 5-10°C (9-18°F) higher than in 2001. Such blistering summers could become the norm by late this century if greenhouse gas emissions aren’t reduced.